Your baby may be more open to broccoli and peas than you think. Make the most of his adventurous palate. Often it’s not the color of spinach or peas he’s reacting to but the bitter taste. It can take a baby up to 15 tastes to accept any new food, says Dyan Hes, M.D., a pediatrician in New York City. 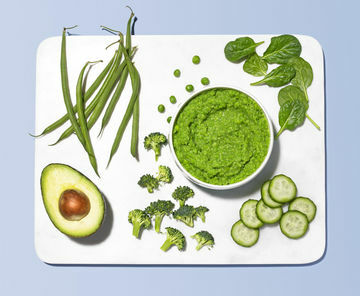 Mix a green bean puree with a sweet potato one; scramble spinach with eggs; or serve an avocado (a less-bitter green food) mashed up. Keep suprising her with new combinations, and don’t take the rejections personally. Since your baby gets most of his calories from breast milk or formula until age 1, take the pressure off plate-cleaning. (In fact, take the pressure off plate-cleaning foreva.) If he won’t eat bits of green beans, then change courses and just encourage him to grasp those pieces. Now you’re honing his fine motor skills, and that’s worth something—it’s what we call a parenting win!